Why book a tour when you can do it on your own? 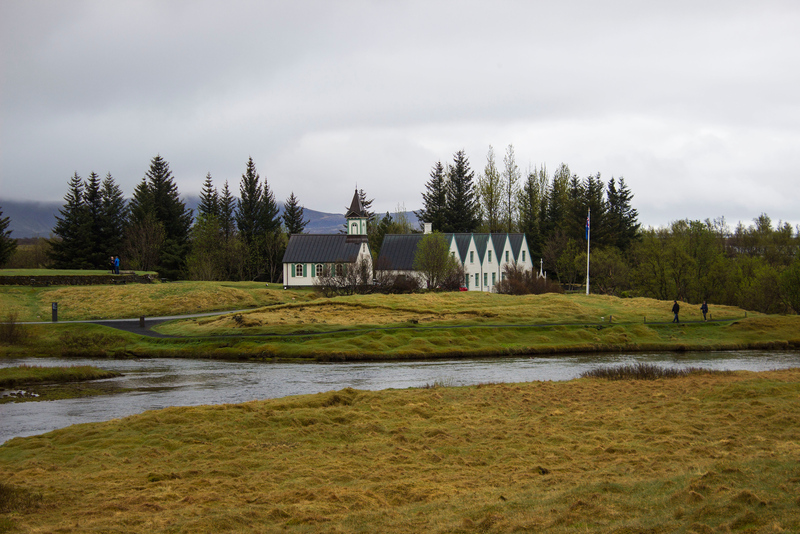 Visit Iceland’s Golden Circle at your own pace on this self drive tour. 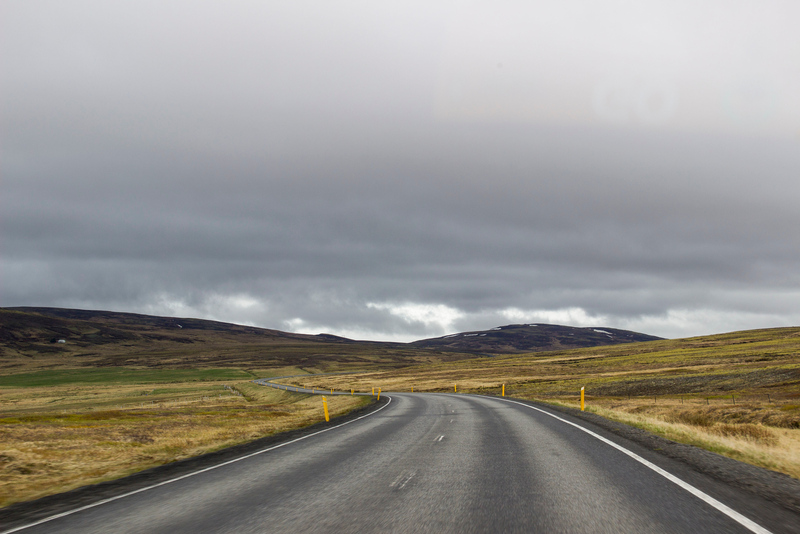 The Golden Circle is a famous driving route in Iceland. It’s popular because it’s so close to Reykjavik. Even if you’re only spending a short amount of time there, I highly recommend that you get out of the city and explore Iceland’s natural wonders. After all, it’s the main reason why Iceland is such an incredible destination. 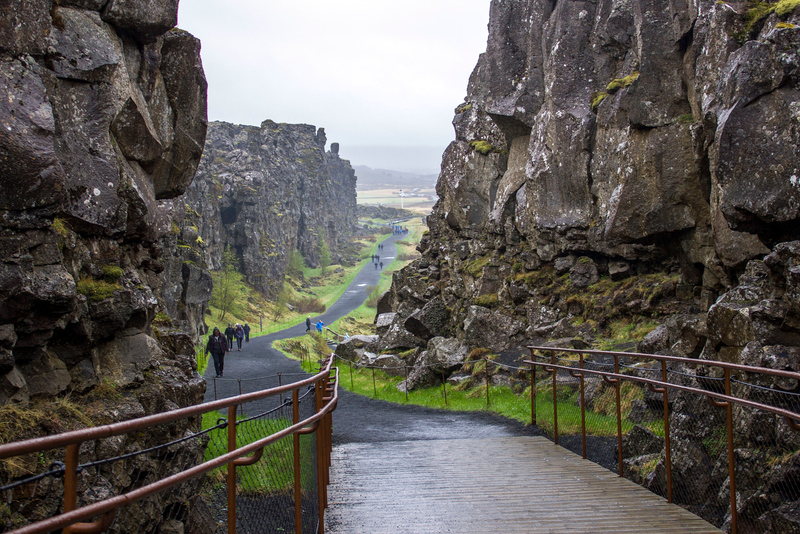 Traveling around the Golden Circle route is easy to do on your own. All you have to do is rent a car. 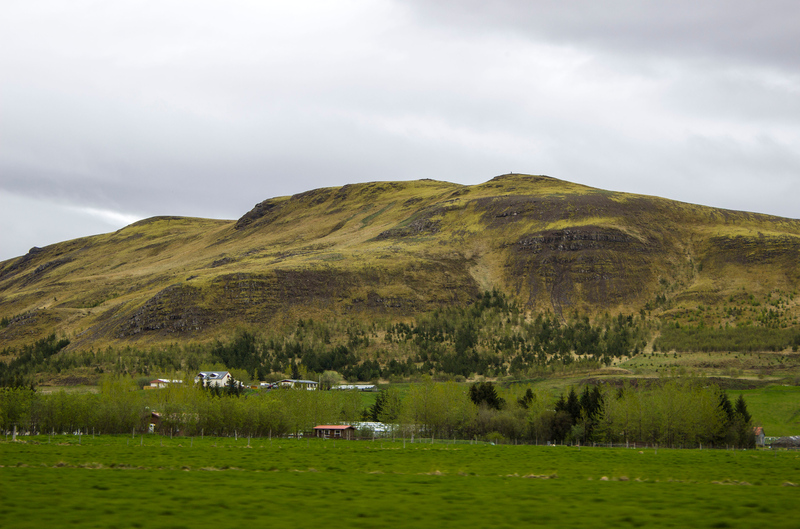 We highly recommend renting a car when visiting Iceland. It gives you the freedom to travel at your own pace, spending as much time as you like at each spot. You can take a closer look at any attraction you happen to pass on your journey. You can move around the entire country with ease, without any restrictions. Don’t worry about booking a 4WD car if you’re traveling around the Golden Circle. The roads are all paved and they’re easy to navigate. There will be lots of signs along the way pointing you in the right direction. However, I always recommend using Google Maps on your phone as it really can be a lifesaver at times! Tip: We used a SIM sticker with KnowRoaming when we traveled to Iceland. It was amazing to have unlimited data for navigating our way around the country. Check out our full review, including a discount for our readers. 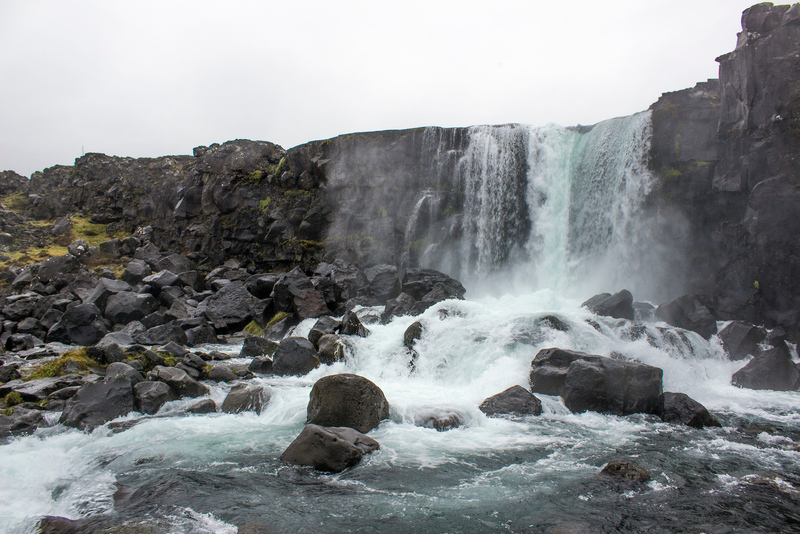 The Golden Circle consists of three main sites: Þingvellir National Park (Thingvellir National Park), Geysir, and Gulfoss. 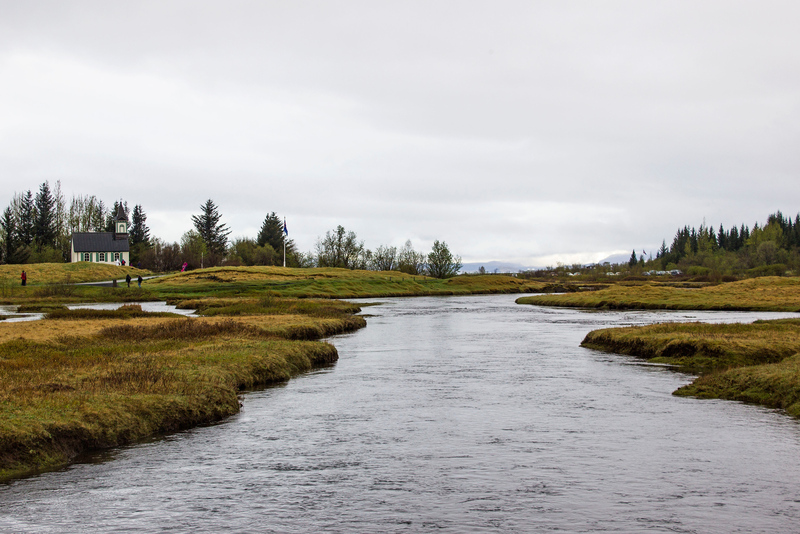 Departing from Reykjavik, the first stop on our Golden Circle self drive tour was Thingvellir National Park. Have you ever visited the Golden Circle? Thingvellir National Park is a UNESCO World Heritage Site. It’s the site of Iceland’s first parliament (AlÞingi) in 930 AD. The first parliamentary proceedings laid the groundwork for a national identity and a united cultural heritage. It also led to the founding of the nation of Iceland. When the assembly met each summer, people would set up temporary buildings called “booths” – walls of rock and turf with a temporary roofing. They would live in these booths for two weeks during the meeting. Even ordinary people gathered here during the meetings to sell their wares, perform, look for work, share news, play games, and have feasts. It was quite the annual event. Many major events in Icelandic history occurred at this site. 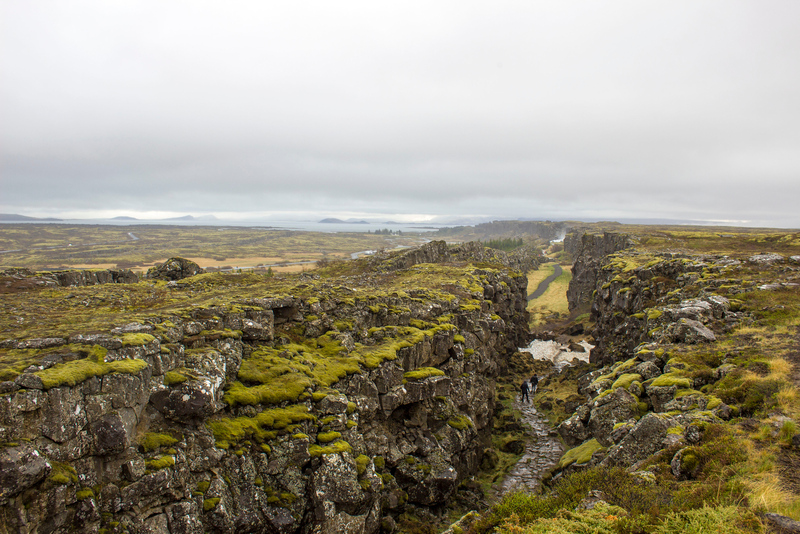 Thingvellir is also the only place in the world where two individual tectonic plates are visible above ground. Most tectonic plate boundaries are only seen underwater. 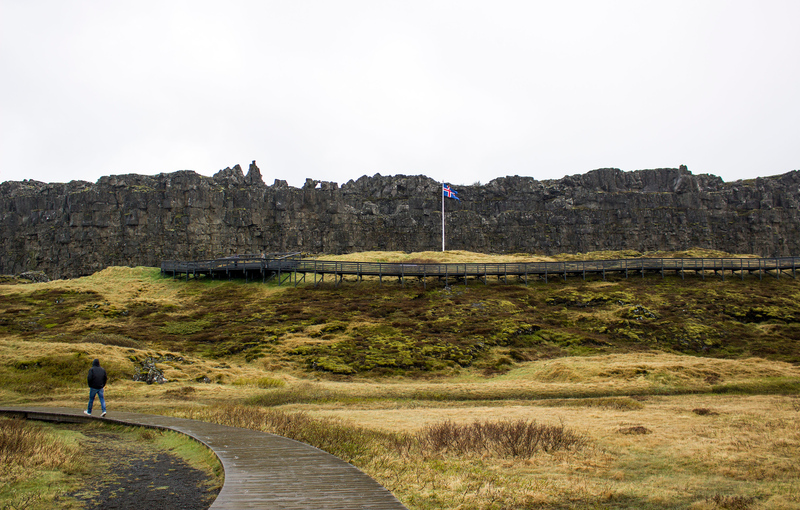 At Thingvellir, the ridges of the North American and Eurasian tectonic plates tower above the ground. You can walk between them. The rift runs right through Þingvallavatn, the largest lake in Iceland. 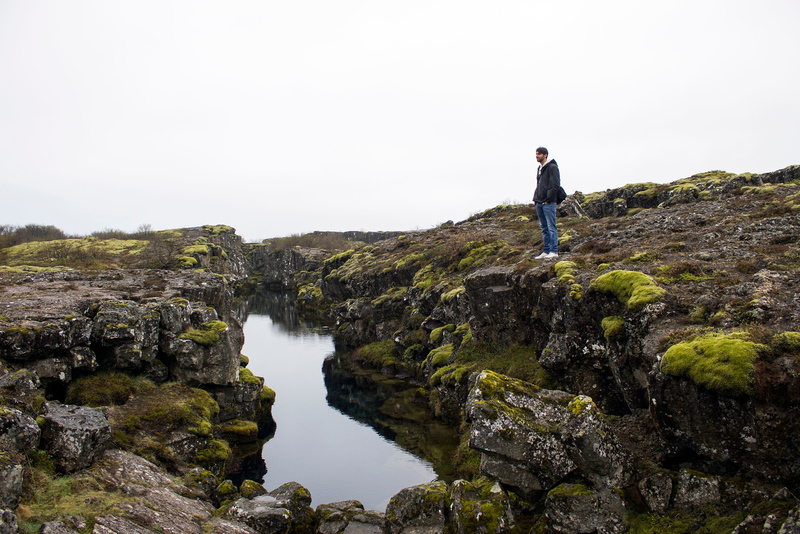 At the Silfra Fissure, a crack between the North American and Eurasian plates at Þingvallavatn, you can snorkel or scuba through the middle. Though Justin and I didn’t get in the water this time around, we’ll have to check it out next time. When you arrive at the visitor center, you’ll have to pay a small amount for parking. There’s a pretty big parking lot and you shouldn’t have any trouble finding space for your car. I recommend that you check out the visitor center. You can purchase a trail map there if you wish, or you can wing it like we did. From the visitor center, we walked down a boardwalk and then a path that winds between the tectonic ridges. 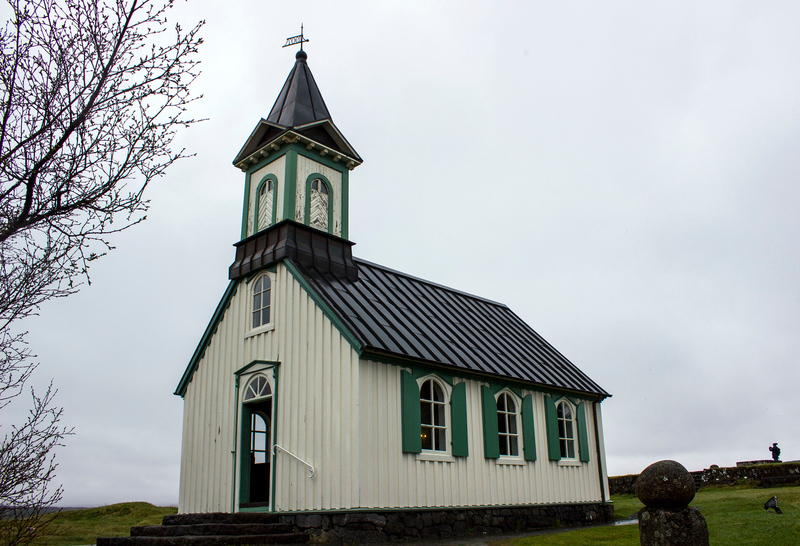 Cross the river and check out Þingvallakirkja Church. 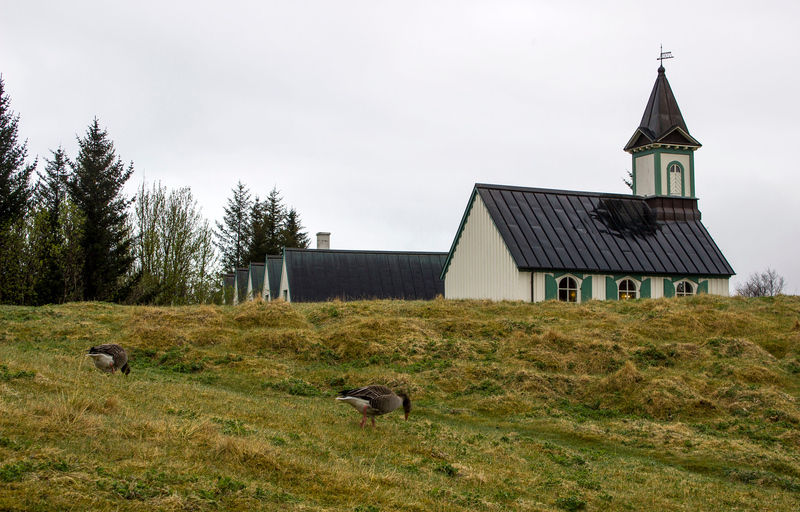 The original church at this site was one of the first churches built in Iceland. Unfortunately, it collapsed in 1118. The church that you’ll see was built in 1859. 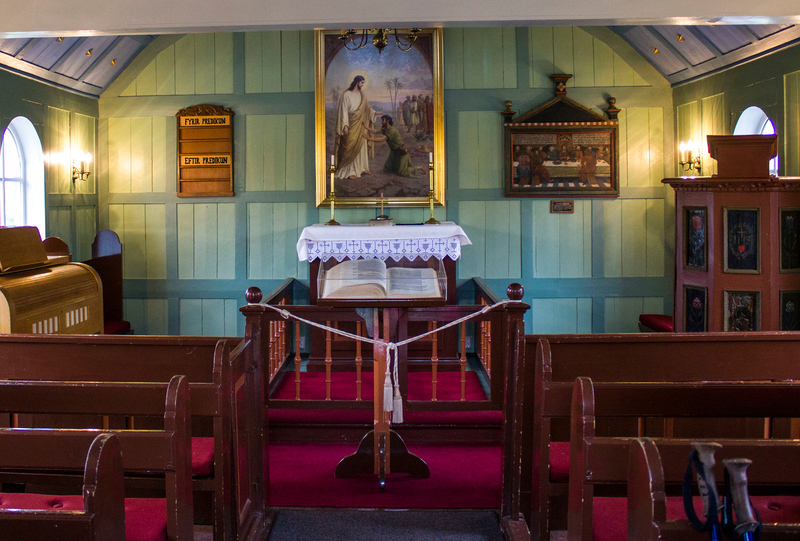 You’re able to take a peek inside the church, too. We walked back to the main path. A little further along, there was some water flowing down the river. Even though you can hike the entire way to Öxarárfoss, we decided to walk back to the car and drive to a closer parking lot. 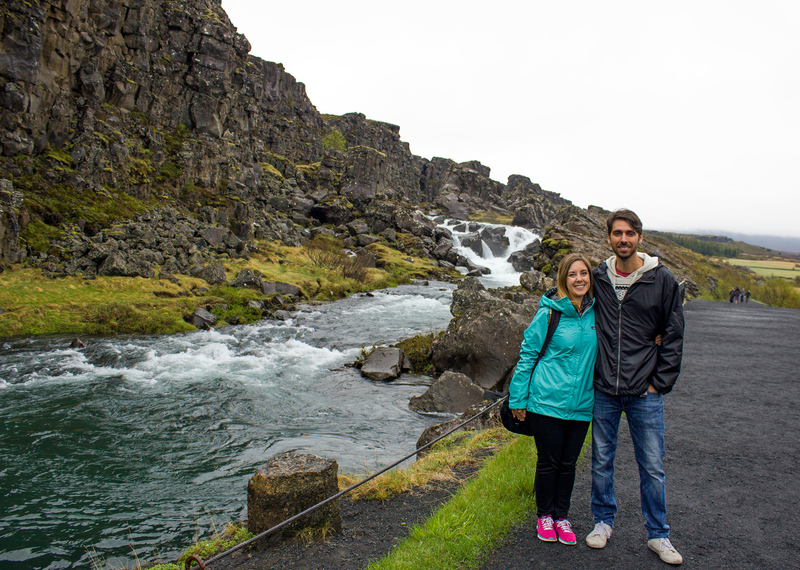 Justin and I wanted to make sure that we left enough time to visit the other two sites along our Golden Circle self drive tour. We drove north on Route 36 from Thingvellir until we saw a small parking lot on the right side of the road. 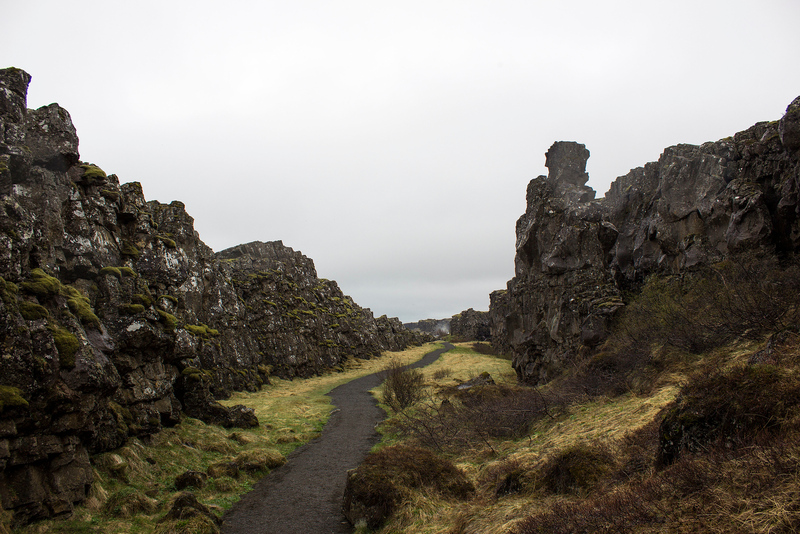 From there, we hiked down a rocky path between the tectonic ridges. 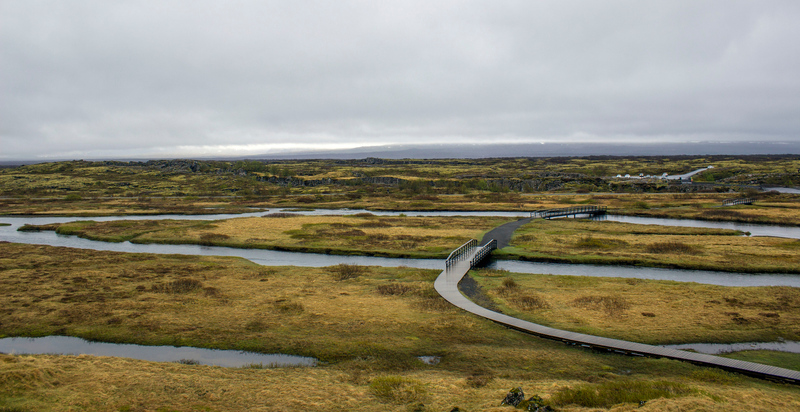 At the end of the path, there was a boardwalk that led to Öxarárfoss (the waterfall at the national park). Afterwards, we did a little more exploring on our own until we were caught in the rain! 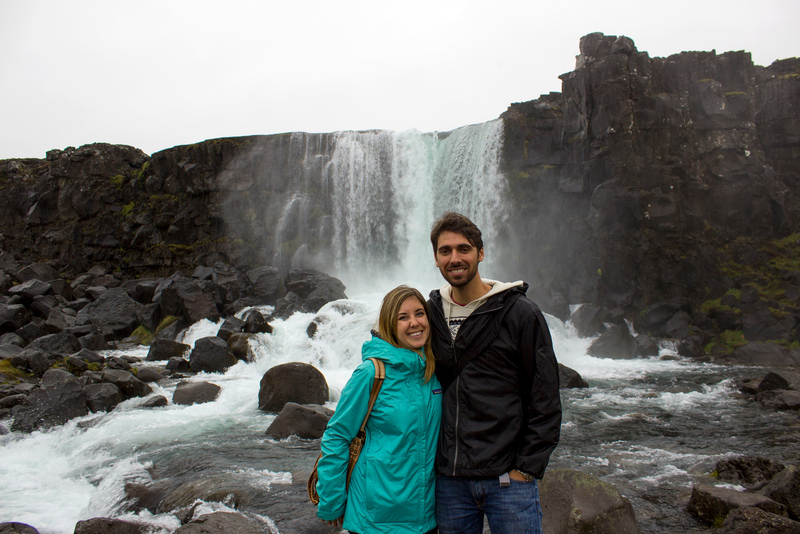 This was only our first day out of Reykjavik, and we were glad that we brought our rain jackets. Iceland’s weather can be so unpredictable. Thankfully, this was the only day out of two entire weeks that it rained (we were very lucky). Thingvellir National Park is one of those places that looks pretty no matter what. I’m sure it looks gorgeous in the winter, too. 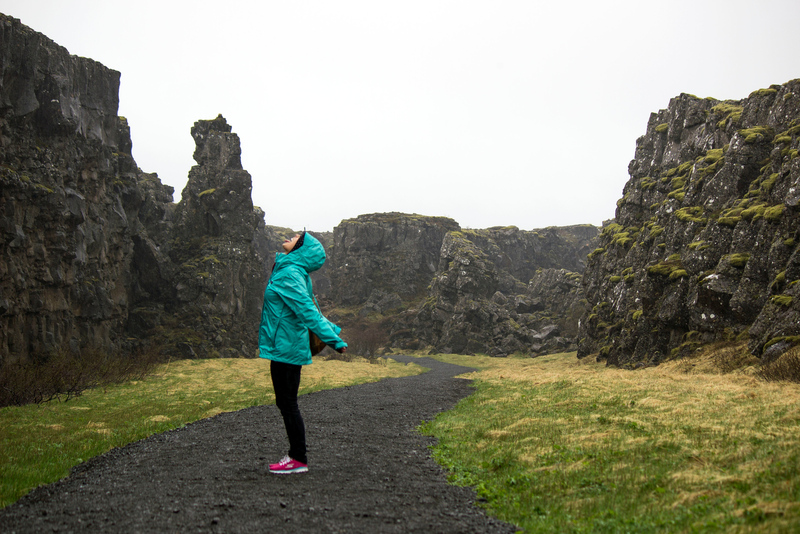 If it rains when you travel to Iceland – it probably will – embrace it! 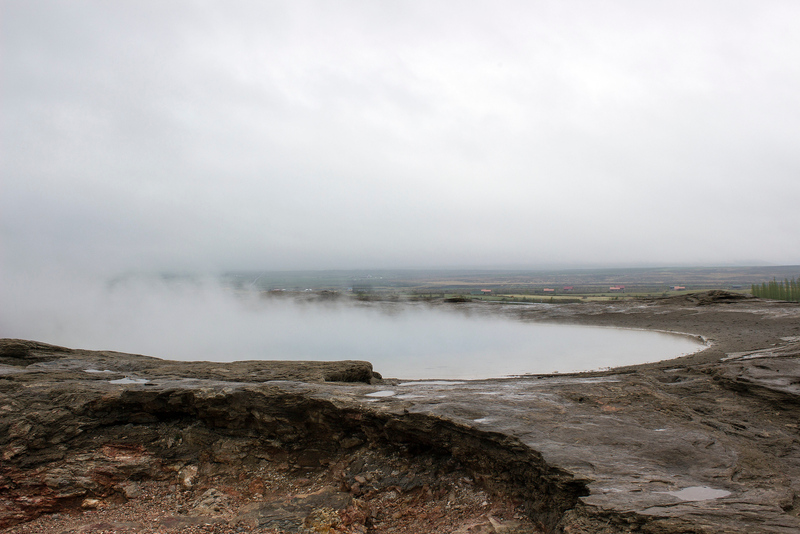 Next stop on the Golden Circle self drive: Geysir! Although we had lots of snacks to keep us going, you can stop for a meal on the way in Laugarvatn. Stop at the restaurant, Lindin, where you can ask about their vegan option. I discovered this restaurant in my personal research for the trip, though I haven’t actually been there myself. 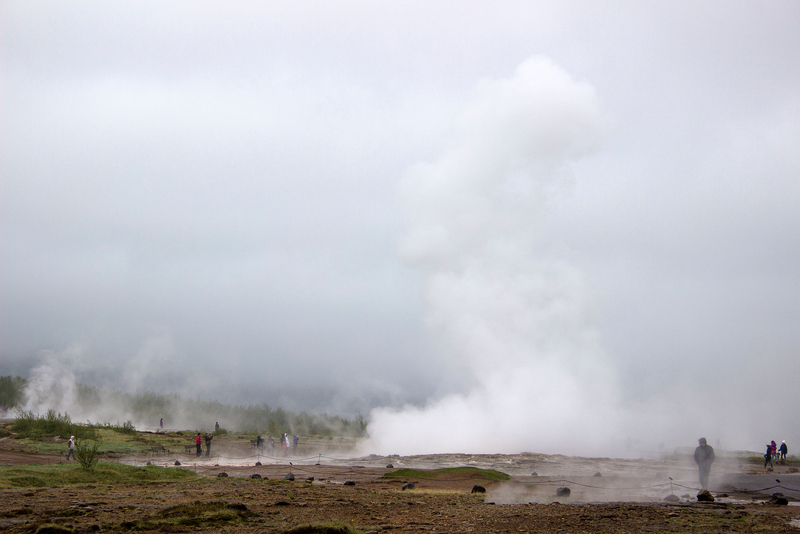 In the Haukadalur geothermal area, you’ll find a site with famous geysers. 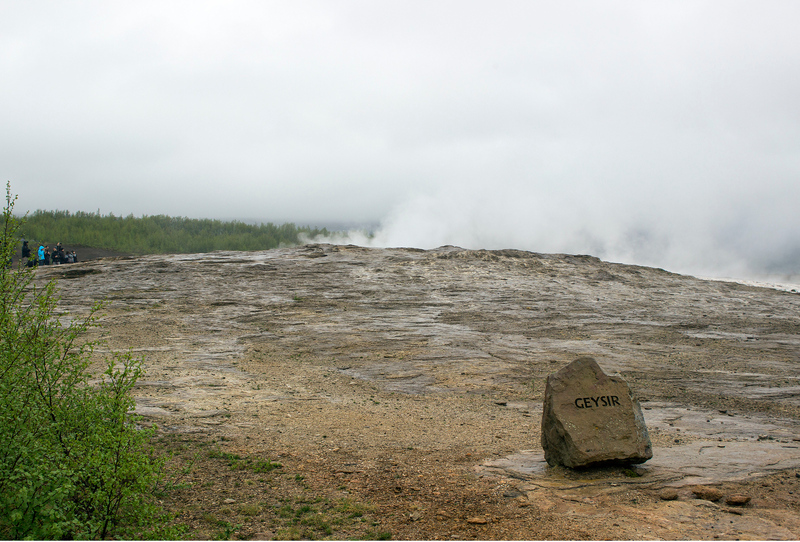 In fact, all geysers are named after the largest one in the area, Geysir. 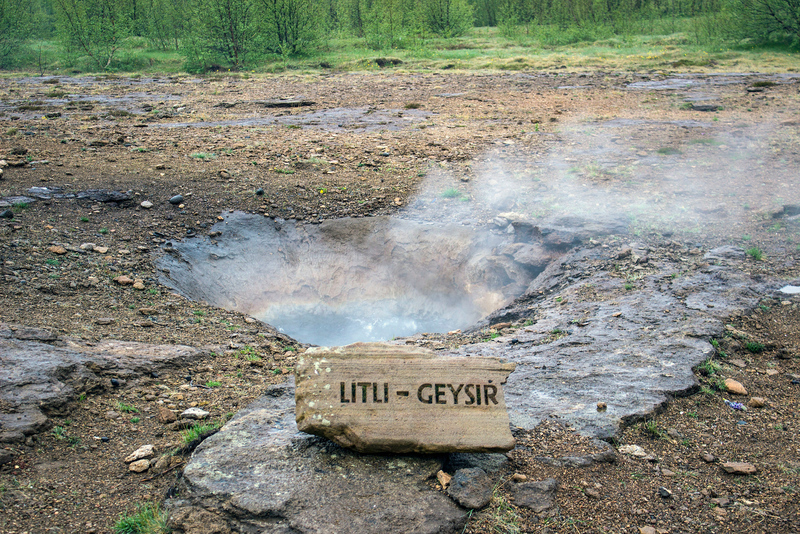 Unfortunately, Geysir rarely erupts anymore. However, there’s a slightly smaller one called Strokkur that erupts very regularly. You can see the hot water burst from the surface once every two to ten minutes. While we were visiting, Strokkur erupted a few times. The water shoots anywhere from 15 to 40 meters high. It’s quite the sight! 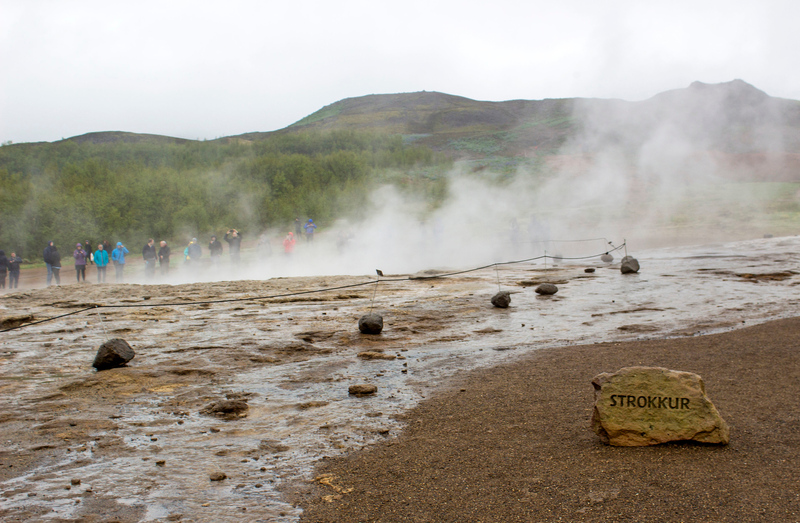 There’s no telling when Strokkur will erupt. As the anticipation builds and builds, the water bursts into the air loudly and violently. It was my first time seeing anything like this before. It’s definitely one of those bucket list items that you must see in your lifetime. You can walk around the marked paths to see other bubbling waters and sulfuric hot springs. There’s also a gift shop and restaurant across the street, which is where you’ll park your car for free. 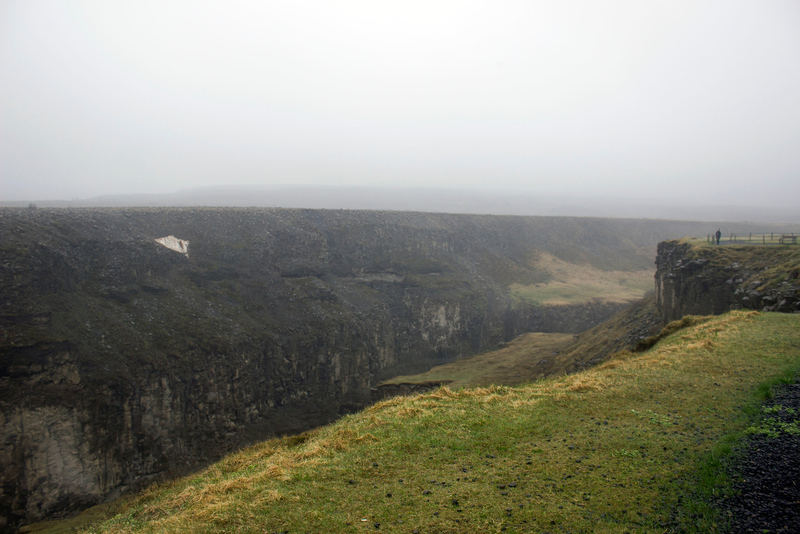 The final stop on our Golden Circle self drive tour: Gulfoss. 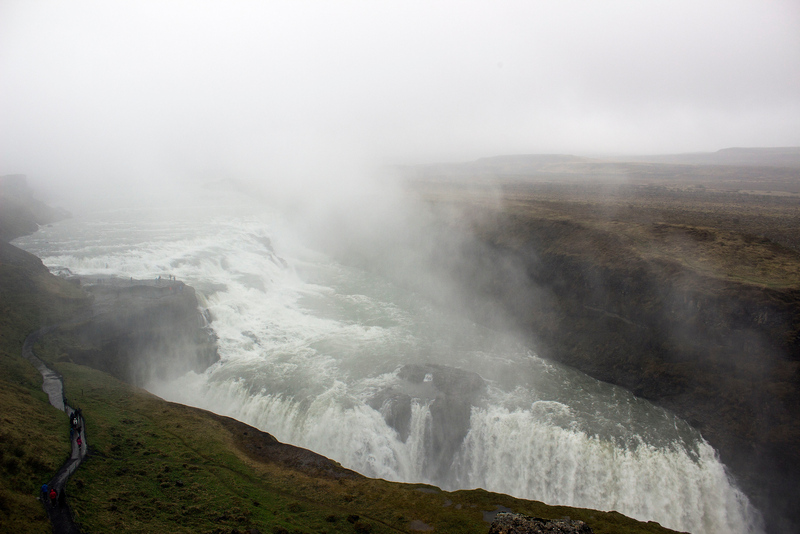 Gullfoss, or the Golden Falls, is a gigantic and stunning waterfall. It was a little too rainy and misty for us, so we don’t have the greatest photographs. I’m sure you can imagine how beautiful it would look on a sunny day. 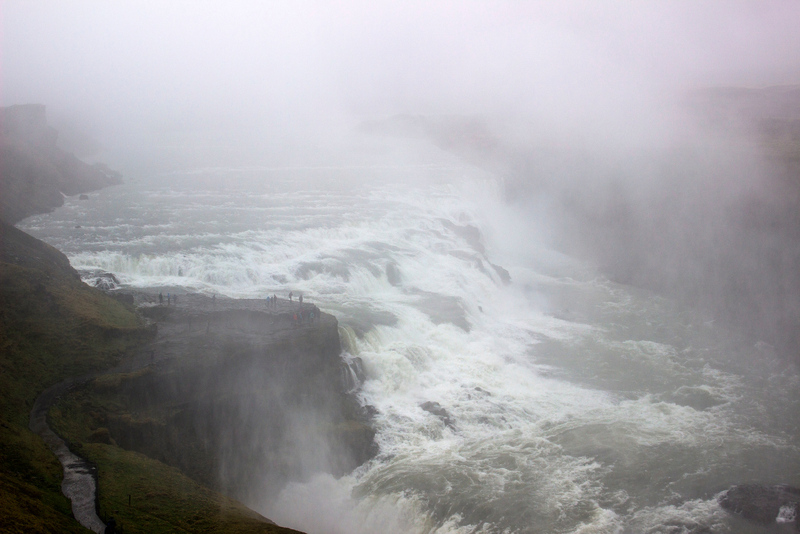 I did enjoy the moody atmosphere as the raging waters plunged over the cliff edge. There are paths along the waterfall so you can get a closer look. We didn’t spend too much time here due to the rain, but it’s quite a magnificent stop. After touring the Golden Circle self drive route, we made our way to Selfoss for our overnight stay at Gesthus Selfoss. Relaxing in our own private hot tub at this beautiful cottage was the perfect way to end the day. 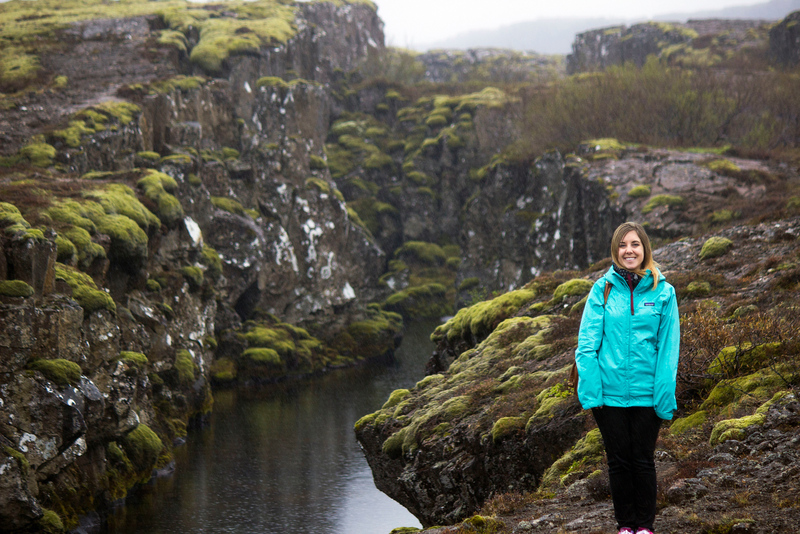 Check out our photo album of our day exploring the Golden Circle! PIN this image to your Pinterest board for future reference – click the top left corner! I want to go! Iceland is incredible, so much to see and just gorgeous! 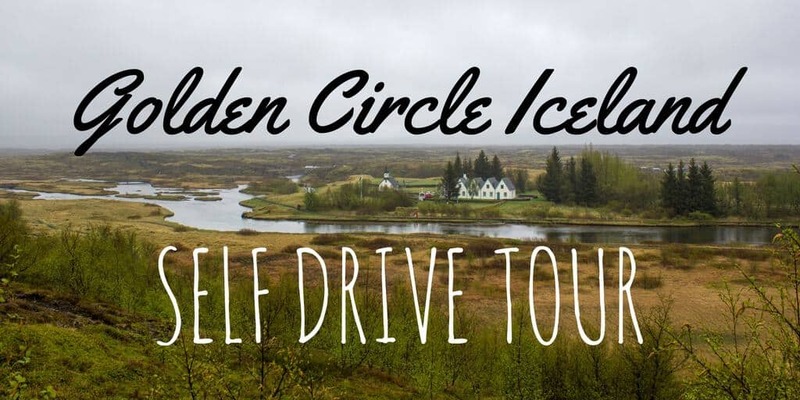 We just came back from Iceland and did a self drive tour of Golden Circle too. It was our favorite part of the trip. Your photos really show how beautiful the drive is! Wow! This is what I call an epic tour! I try to do my own self-walking or self-drive tours as much as possible. I love the freedom they afford. Plus, it is good to have some room for the unexpected. 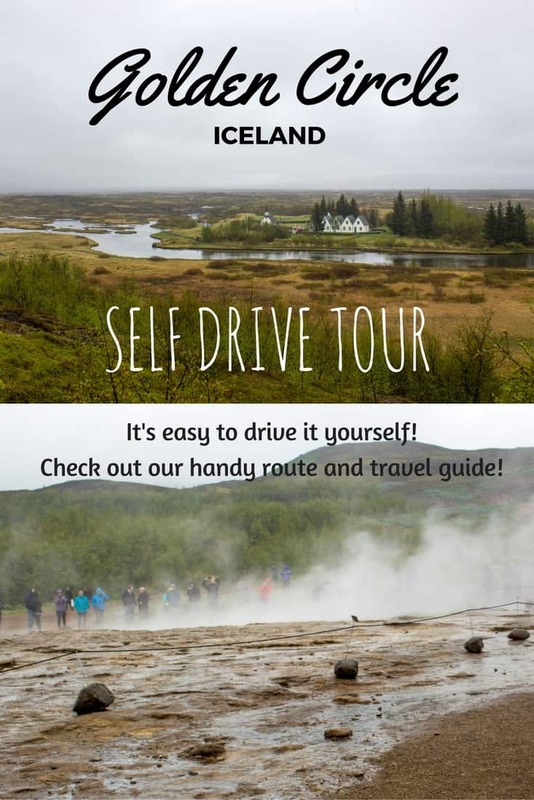 For what I have read, the infrastructure in Iceland is perfect for self-drives. It’s so important to be able to go on internet where ever you are. We always seem to forget to do research in advance and to get a good offer for roaming. How was the cell phone connection in Iceland going to remote places? Hey Lauren I was browsing for Iceland road trip and found your post here! I’m planning to cover your exact spots in a day… but in winter with shorter day light. Wish me luck!